With so many surrogates and intended parents across the country looking for their perfect match, it’s more common today than ever for an interstate surrogacy to be arranged. So, how exactly is this process different from matching with a surrogacy partner in your own state? When you work with a surrogacy professional like American Surrogacy, it’s really not that different. You’ll receive the same level of quality case management, support and counseling services no matter where your surrogate or intended parent is located. Our surrogacy specialists work hard to ensure that an interstate surrogacy match does not negatively affect your journey, but you will always have the chance to choose the desired location of a surrogacy match. Because the surrogate’s state is where the majority of the legal surrogacy process will take place, it’s her state laws that will impact your surrogacy journey. Therefore, even if you live in a state that is not surrogacy-friendly, you can still become parents with a surrogate from another state. Indeed, this will likely be your best path of action. If you are a surrogate in a state that is not surrogacy-friendly, it will be difficult and risky to complete a surrogacy where you live. 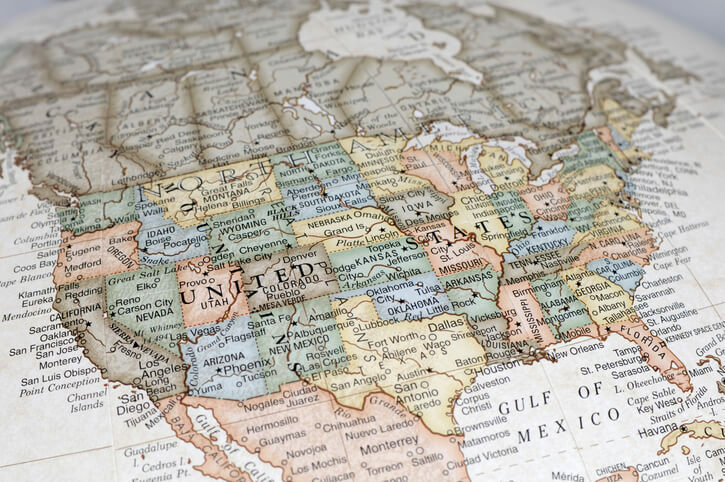 Many times, surrogacy agencies and attorneys will not work with surrogates from these states. Once you find a surrogacy match, your surrogacy attorney and your partner’s surrogacy attorney will discuss the applicable laws for your situation. These will be laid out in your surrogacy contract and determine what steps to take moving forward. In most surrogacies, intended parents and surrogates are not located closely enough to be in constant face-to-face contact. Most of their communication takes place over texts and emails, with intended parents coming to the surrogate for important milestones like ultrasounds. In this way, an interstate surrogacy is not much different. Most of the communication will take place in the same manner (although time zone differences may have to be considered). However, depending on distance, intended parents may not be able to attend as many ultrasounds or complete as many visits prior to their baby’s birth. This does not necessarily mean your relationship won’t be strong; it will just be conducted in a long-distance way and, therefore, may require additional effort. The distance won’t just affect your surrogacy communication. It can also conceivably make it harder for intended parents to get to their surrogate in case something unexpected occurs. Before you solidify an interstate surrogacy match, speak with your surrogacy professional about the logistics of your communication and create a contact schedule that both parties are comfortable with. On the same note, remember that out-of-state intended parents may not be able to be present right on time for an unexpected, early delivery. However, intended parents do make plans to travel to the surrogate’s state slightly before her due date or induction date. This way, they can better ensure they are there for the birth of their child. As part of your surrogacy plan, your surrogacy specialists will help you create a hospital delivery plan. This will lay out the expectations of the delivery, including what kind of procedures a surrogate will have, who will be present in the delivery room, what kind of lodging is available for intended parents and more. Even if you are an intended parent coming from out of state, you will still be equally prepared for the hospital stay. The intended parents’ surrogacy attorney will work with them to ensure proper parental rights are established after birth. Depending on the surrogate’s state laws, a parentage order may be executed before or after birth, or an adoption completed post-birth, if needed. One final thing to consider about interstate surrogacy journeys is the return to your home state if you are an intended parent. Returning home with a new baby will be much more complicated than your original trip for the surrogate’s delivery. If you will need to take a plane home, consider how you can do so in the best interest of your new baby. Most airlines will allow babies to fly as long as they are two days old, but talk with your pediatrician and evaluate your own comfort when creating this plan. Whether you end up flying or taking another mode of transportation home, make the preparations to safely move and care for your baby during this journey. Remember, you will always be able to choose the location of your surrogacy partner, whether you are a surrogate or an intended parent. Our surrogacy specialists can explain in detail how this may affect your wait time, as well as how our agency can guide you through a surrogacy in a different state. Learn more by calling us at 1-800-875-2229(BABY) today.